Motion Traces (2004: Golan Levin and Zachary Lieberman with the production of Scott Ritter and Ars Electronica Futurelab). Mobile service provider Mobilkom Austria commissioned Austrian design team EOOS and the Ars Electronica Futurelab to develop an innovative design for a privately-owned public space within its new concept store. 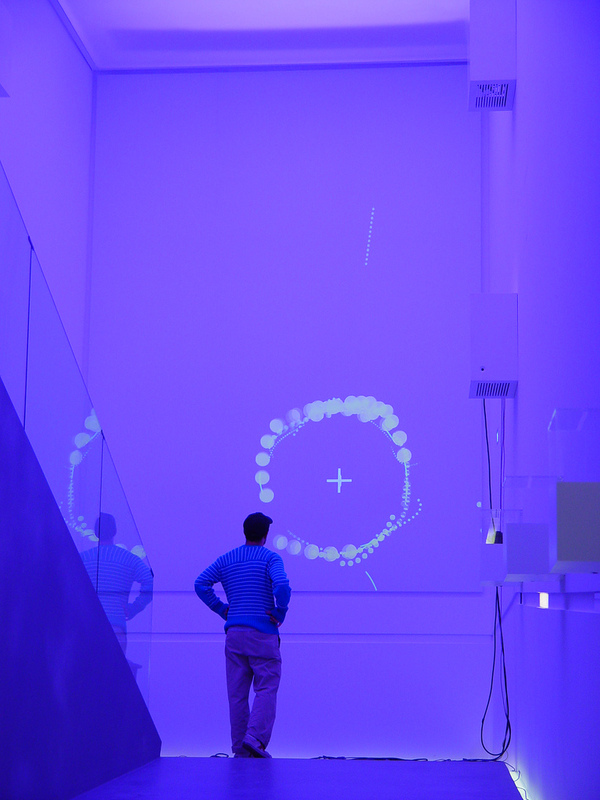 Together with architect Scott Ritter and media artists Golan Levin and Zachary Lieberman, the team created Motion Traces, an interactive artwork. Motion Traces synchronizes a combination of computer-graphic video projections and color-controlled room illumination to react to the movements of visitors in the A1 Lounge. 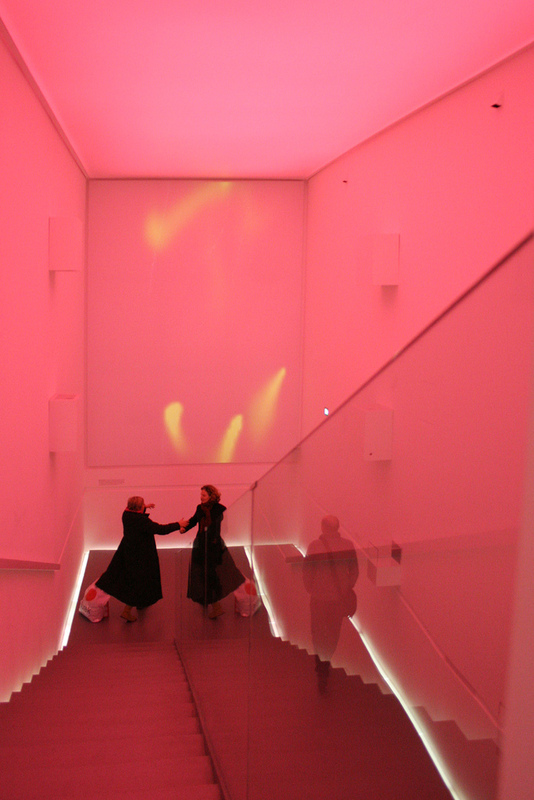 In this space, the visitor encounters a large responsive projection at a turning-point in an open stairwell corridor. This projection reflects the presence and motion of the visitors in a variety of ways, thus incorporating the visitors into the active skin of the architecture. Several of the system’s visualizations resemble fluids; others recall the gentle waves of wind-blown fields of grain. In another responsive sequence that plays on flows of digital data, systems of lines drift through the ether, so that the visitor moves simultaneously through a real setting as well as through an environment of information that projections make visible. This installation takes advantage of the latest developments in the field of computer vision, motion analysis and computer-aided simulation of physical flows. 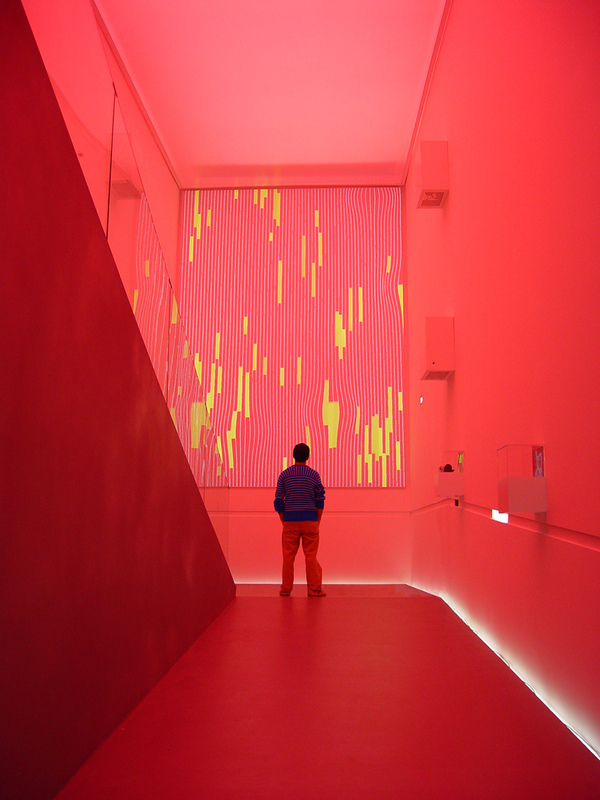 The interactive work of art consists of four synchronized projections that are blended together, and a computer-controlled LED lighting system which changes the entire color of the space. The result is an architecture transformed by a lively, dynamic and interactive component of the environment. 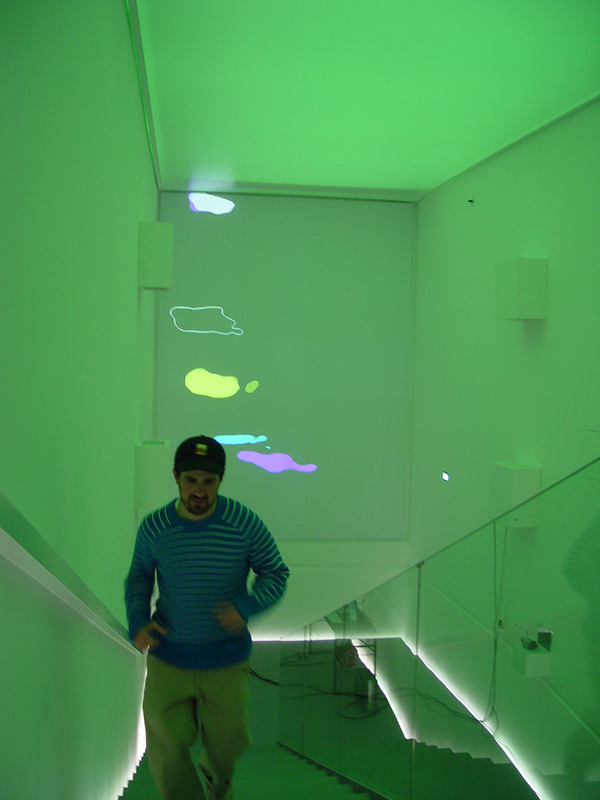 The following 1'45" video illustrates some of the interactive "scenes" in the Motion Traces artwork. 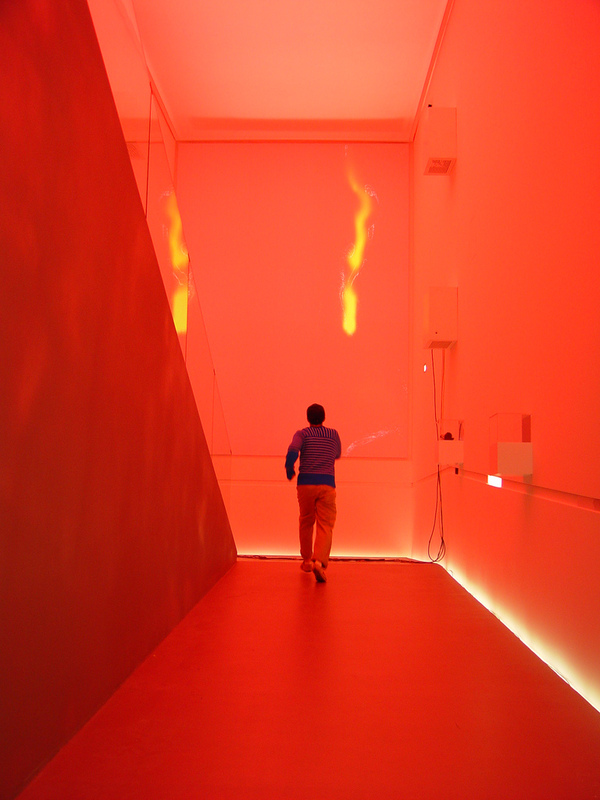 In each scene, the video projection presents a different graphical interpretation of the the visitors' movements through the corridor space. 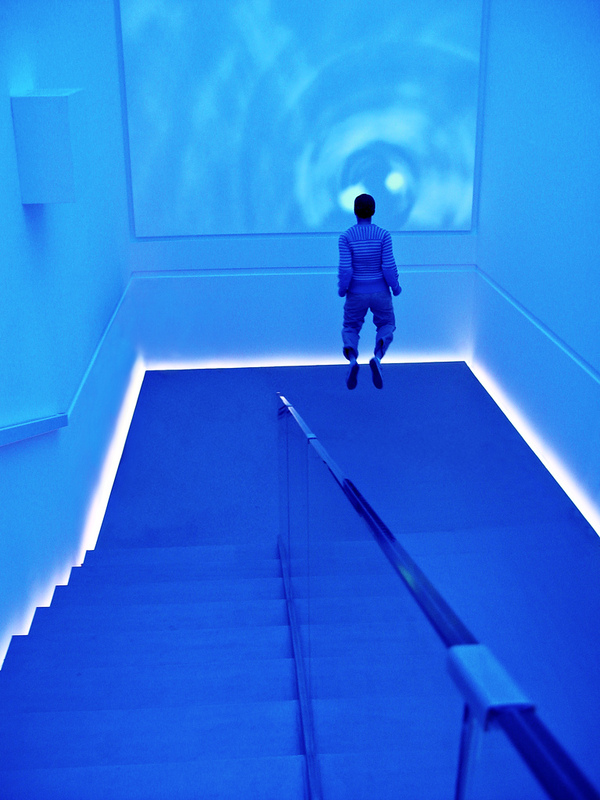 Each scene also has an associated color, which is diffused throughout the room by a computer-controlled lighting system. The seven scenes change cyclically every two minutes. Motion Traces (A1 Corridor) by Tmema + AEC from Tmema on Vimeo. Also available at YouTube. 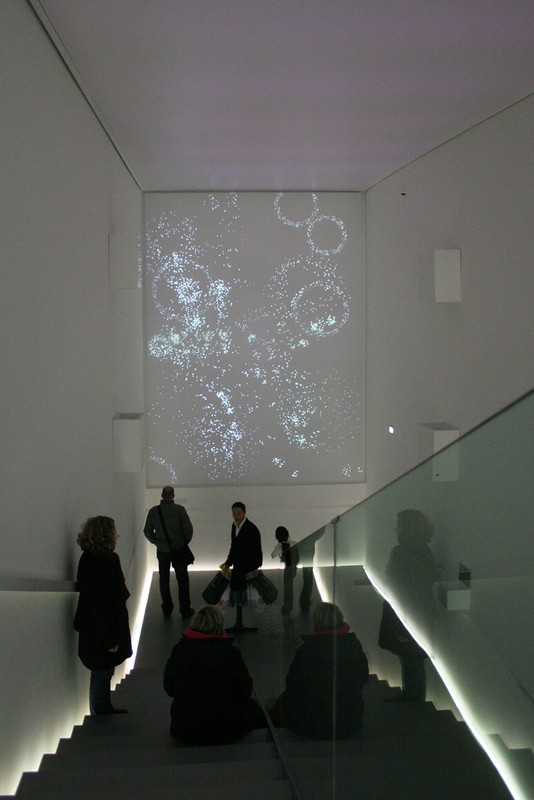 More information about Motion Traces can be found on its official web page at the Ars Electronica Center. High-resolution photographs of the Motion Traces installation are available in this Tmema photoset on Flickr. Video of Motion Traces can be found online at YouTube.